Meet 5-year-old Maria. She was diagnosed with spastic quadriplegic cerebral palsy and microcephaly at birth. When Maria was born, she weighed less than 1 pound and was 4 months early. No one expected her to survive, but mom says she has always been quite the warrior. 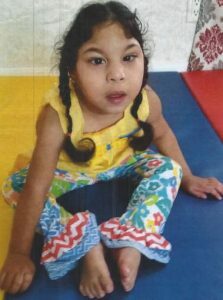 Maria cannot walk and is nonverbal; however, Maria is a happy child, always offering a smile to her loved ones. Maria enjoys watching soccer with her dad. Maria and her family were invited to a live soccer game, and mom says that she couldn’t believe just how much Maria seemed to enjoy it. Maria also loves cartoons, but especially loves My Little Pony and Moana. At reading time, Maria enjoys when her family reads her Little Red Riding Hood. Maria needs a therapy tricycle to help build her leg strength, endurance, and coordination. Please be her sponsor!